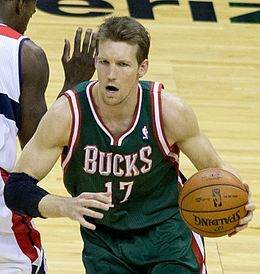 For other people named Mike Dunleavy, see Mike Dunleavy (disambiguation). Michael Joseph Dunleavy Jr. (born September 15, 1980) is an American former professional basketball player who is a pro scout for the Golden State Warriors of the National Basketball Association (NBA). He previously played for the Golden State Warriors, Indiana Pacers, Milwaukee Bucks, Chicago Bulls and Cleveland Cavaliers. He is the son of long-time NBA player and former NBA head coach Mike Dunleavy Sr.
As a 1999 graduate of Jesuit High School in Beaverton, Oregon, Dunleavy led them to the 1999 4A State Boys Basketball Championship over North Salem High School, 65–38. Dunleavy attended the University School of Milwaukee for his freshman year, and Homestead High School in Mequon, Wisconsin for his sophomore year. Dunleavy played at Duke University from 1999–2002. As a sophomore, he played on Duke's national championship team and scored a team-high 21 points in the title game, including 3 three-pointers during a decisive 11–2 second-half Duke run. As a junior, Dunleavy was a first-team NABC All-American, averaging 17.3 points per game and 7.2 rebounds per game for the 31–4 Blue Devils. In 2001–02, Dunleavy, Jay Williams, and Carlos Boozer each scored at least 600 points for the season, a feat only matched at Duke by Jon Scheyer, Kyle Singler, and Nolan Smith in the 2009–10 season. Dunleavy was selected by the Golden State Warriors third overall in the 2002 NBA draft. In November 2005, the Warriors signed Dunleavy to a 5-year, $44 million contract extension. The Warriors' general manager Chris Mullin said, "The way Mike performed, the way he conducted himself and the way we run our organization, we both felt it was something that we wanted." The deal has drawn criticism from fans, though, in light of the other large contracts that the Warriors franchise has signed, including Adonal Foyle and Derek Fisher. During the 2005–06 season, Dunleavy lost his starting role as small forward for a number of games, due partly to a shooting slump. He won back the starting job later in the season and was expected to start at his new position of power forward for the 2006–07 season. Some early struggles, however, prompted Warriors head coach Don Nelson to send Dunleavy back to the bench, juggling his lineup in search of better team chemistry and winning results. On January 17, 2007, Dunleavy was dealt to the Indiana Pacers along with teammates Troy Murphy, Ike Diogu, and Keith McLeod for Stephen Jackson, Al Harrington, Šarūnas Jasikevičius, and Josh Powell. In his first full season with the Pacers, Dunleavy started all 82 games and averaged a career-high 19.1 points per game. During the 2010–2011 season, the Indiana Pacers advanced to the NBA playoffs for the first time since 2006 thanks to an end of the season win over the Washington Wizards coupled with a Charlotte Bobcats loss to the Orlando Magic. Dunleavy scored 14 points in the 136–112 victory. Dunleavy also ended his career playoff drought of 9 years and 624 games. He was the second active leader in this category behind former Warriors and Pacers teammate Troy Murphy, who also ended his drought as a part of the Boston Celtics. Chris Wilcox of the Boston Celtics now holds the record. Following the 2011 NBA lockout, Dunleavy signed a two-year, $7.5 million contract with the Milwaukee Bucks on December 10. His best game as a Buck came on November 3, 2012 when he recorded 29 points and 12 rebounds against the Cleveland Cavaliers. On July 10, 2013, Dunleavy signed with the Chicago Bulls, on a reported two-year deal worth about $6 million. On April 25, 2014, Dunleavy set a playoff career-high 35 points including a franchise playoff record for most three-point field goals with 8 against the Washington Wizards in game three of their 2014 NBA Playoffs first round match-up, which the Bulls won 100–97. Dunleavy injured his right ankle against the Denver Nuggets on January 1, 2015 and was sidelined for over a month. On July 14, 2015, Dunleavy re-signed with the Bulls to a reported three-year, $14.4 million contract. After missing the Bulls' first 16 games of the season due to a back injury, he was ruled out for a further four-to-six weeks on December 3 due to the injury requiring additional rehabilitation. On February 1, 2016, using the flexible assignment rule, Dunleavy was assigned to the Santa Cruz Warriors, the D-League affiliate of the Golden State Warriors, with the goal to practice there during the Bulls' West Coast road trip. Two days later, he was recalled by the Bulls. On February 6, Dunleavy made his season debut for the Bulls after missing the first 49 games. He played 14 minutes and scored five points in a 112–105 loss to the Minnesota Timberwolves. On July 7, 2016, Dunleavy was traded, along with the rights to Vladimir Veremeenko, to the Cleveland Cavaliers in exchange for the rights to Albert Miralles. He made his debut for the Cavaliers in the team's season opener on October 25, 2016 against the New York Knicks. In 22 minutes off the bench, he recorded four points, four rebounds, two assists and three steals in a 117–88 win. On December 23, 2016, he scored a season-high 14 points in a 119–99 win over the Brooklyn Nets. 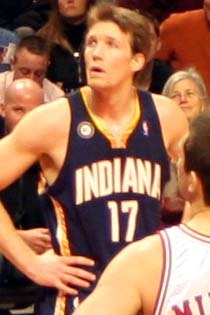 On January 7, 2017, Dunleavy was traded, along with Mo Williams and a future first-round draft pick, to the Atlanta Hawks in exchange for Kyle Korver. After initially refusing to report to the Hawks while seeking a buyout of his contract, Dunleavy changed his mind and agreed to join the Hawks. On January 10, he reported to the team and passed his physical. Three days later, he made his debut for the Hawks, scoring six points on a pair of three-pointers in a 103–101 loss to the Boston Celtics. On January 15, he scored 20 points off the bench in a 111–98 win over the Milwaukee Bucks. It was his first 20-point performance since a first-round playoff game for Chicago on April 30, 2015. On March 3, 2017, Dunleavy was diagnosed with right ankle synovitis. He returned to action on March 22 against Washington after a 13-game injury layoff. On June 30, 2017, he was waived by the Hawks. On September 24, 2018, Dunleavy was hired by the Golden State Warriors as a pro scout. Dunleavy has two younger brothers: Baker, who played at Villanova from 2002–06 and is the current head coach at Quinnipiac; and James, who was a walk-on for USC and is currently an NBA player agent. His father is Mike Dunleavy Sr., former Los Angeles Clippers coach, retired NBA player, and the former head coach at Tulane. While growing-up, Dunleavy attended a residential sports camp in Eagle River, Wisconsin called Camp Menominee. In 2008, Camp Menominee honored Dunleavy by naming its basketball courts "The Mike Dunleavy Jr. Courts". ^ "2002 NBA Draft: Mike Dunleavy Jr. Draft Bio". ESPN.com. Retrieved March 29, 2010. ^ "Notes: Duke 78, Baylor 71". GoDuke.com. March 28, 2010. Retrieved March 29, 2010. ^ "Dunleavy signs deal hours ahead of deadline". ESPN. Retrieved August 30, 2018. ^ "Pacers, Warriors announce 8-player deal". MOPSquad.com. January 17, 2007. Retrieved December 23, 2007. ^ Brunner, Conrad (April 6, 2011). "Wizards-Pacers notebook". NBA.com. Retrieved April 12, 2011. ^ von Horn, Steve (December 10, 2011). "Mike Dunleavy Signing: You Can Like It For 'Basketball Reasons'". BrewHoop.com. SB-Nation. Retrieved December 4, 2015. ^ "Mike Dunleavy 2012-13 Game Log". Basketball-Reference.com. Retrieved August 31, 2013. ^ "Bulls sign free agent guard/forward Mike Dunleavy". NBA.com. July 10, 2013. Retrieved August 31, 2013. ^ Harper, Zach (July 1, 2013). "Report: Mike Dunleavy, Chicago Bulls verbally agree to two-year deal". CBSSports.com. Retrieved July 1, 2013. ^ White, Joseph (April 26, 2014). "Bulls beat Wizards 100-97, trail series 2-1". Sports.Yahoo.com. Retrieved April 26, 2014. ^ Johnson, K.C. (January 9, 2015). "Bulls' Mike Dunleavy to have MRI on nagging ankle injury". ChicagoTribune.com. Chicago Tribune. Retrieved January 9, 2015. ^ "Bulls sign Mike Dunleavy". NBA.com. July 14, 2015. Retrieved July 14, 2015. ^ Wojnarowski, Adrian (July 1, 2015). "Sources: Mike Dunleavy agrees to deal to return to Bulls". Sports.Yahoo.com. Retrieved July 14, 2015. ^ Wojnarowski, Adrian (December 4, 2015). "Sources: Mike Dunleavy needs 4-to-6 weeks before return to basketball activities". Sports.Yahoo.com. Retrieved December 4, 2015. ^ "BULLS ASSIGN MIKE DUNLEAVY TO D-LEAGUE". NBA.com. February 1, 2016. Retrieved February 1, 2016. ^ Spears, Marc J. (February 1, 2016). "Ex-Warrior Mike Dunleavy will practice but won't..." Twitter. Retrieved February 1, 2016. ^ "BULLS RECALL DUNLEAVY FROM THE SANTA CRUZ WARRIORS". NBA.com. February 3, 2016. Retrieved February 3, 2016. ^ Krawczynski, Jon (February 6, 2016). "Timberwolves close out Bulls with 12-0 run to win 112-105". NBA.com. Retrieved February 7, 2016. ^ "Cavaliers Acquire Forward Mike Dunleavy From Chicago". NBA.com. July 7, 2016. Retrieved July 7, 2016. ^ "James, Love lead Cavs to 119-99 rout of Nets; Warriors next". ESPN.com. December 23, 2016. Retrieved December 23, 2016. ^ "Hawks Acquire First Round Pick, Dunleavy & Williams From Cavs For Kyle Korver". NBA.com. January 7, 2017. Retrieved January 7, 2017. ^ Pollakoff, Brett (January 9, 2017). "Mike Dunleavy changes his mind, reportedly agrees to join Hawks after trade from Cavaliers". FoxSports.com. Retrieved January 10, 2017. ^ Vivlamore, Chris (January 10, 2017). "Dunleavy Jr. reports to Hawks, passes physical". AJC.com. Retrieved January 10, 2017. ^ "Thomas steadies Celtics, Horford triumphant in return home". ESPN.com. January 13, 2017. Retrieved January 14, 2017. ^ "Bazemore, Dunleavy pick up offense, Hawks beat Bucks". ESPN.com. January 15, 2017. Retrieved January 15, 2017. ^ "Dunleavy Out With Right Ankle Injury". NBA.com. March 3, 2017. Retrieved March 3, 2017. ^ "Beal, Wall lead Wizards to 104-100 win over Hawks". ESPN.com. March 22, 2017. Retrieved March 23, 2017. ^ "Hawks Waive Mike Dunleavy". NBA.com. June 30, 2017. Retrieved June 30, 2017. ^ "Warriors Announce Promotions and Additions to Basketball Operations Staff". NBA.com. September 24, 2018. Retrieved September 24, 2018.